To Teneriffa on the "Ships starting with T" page. Source: Historical Department, MAN B&W Diesel, Copenhagen, who also sent me this picture from the launch. (Size and quality reduced in order to save space). Another picture is available on this external page. Machinery: 2 x 6 cyl. 4 SCSA oil engines totalling 3100 ihp by the shipbuilders, driving twin screws. Launched by Burmeister & Wain's Maskin- og Skibsbyggeri A/S, Copenahgen (Yard No. 320) on Dec. 15-1921, completed May 3-1922. Nov. 19 Clyde   OB 245 For St. John, N.B. Dispersed 56 35N 17 38W, Nov. 22. For information on voyages made in between those mentioned here, please see the document received from the Norwegian Archives and A. Hague's Voyage Record above. Follow the convoy links provided for more details; the Commodore's notes are also available for most of them and other Norwegian ships also took part. Together with Belinda, Teneriffa is listed in Convoy HG 22 from Gibraltar to the U.K. on March 12-1940, bound for Newport, station 53, arriving her destination on March 22. According to the Commodore's notes, she had parted company with the convoy at 15:45 on March 20, in 57 35N 6 10W, escorted by HMS Witch. She later proceeded to Swansea, where she arrived Apr. 5 and from the archive document, we learn that she was still there when war broke out in Norway on Apr. 9. Having made a voyage to France and back to the U.K. in May, she sailed from Plymouth to New York, arriving June 10, subsequently remaining there for a long time - departure is given as Sept. 3, when she proceeded to Halifax. 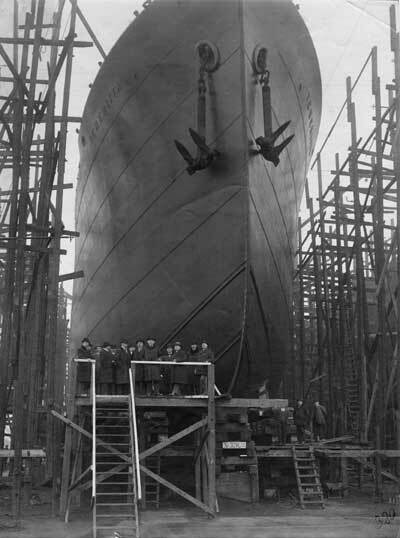 According to A. Hague, this long stay in New York was due to crew trouble (my page about Nortraship has some information on the problems in those early days of war in Norway). It'll be noticed, when going back to the archive document, that she also had a long stay in Halifax. With a cargo of steel, general and "special", she headed back to the U.K. on Oct. 12-1940 in Convoy HX 80. Her destination is given as Glasgow, where she arrived on Oct. 27, having sailed in station 32. (The Advance Sailing Telegram for this convoy indicates that she had originally been intended for the previous convoy on Oct. 8, HX 79, which lost several ships; follow the link for details). The following month we find her, along with Bra-Kar and Snar, in Convoy OB 245, which originated in Liverpool on Nov 18 and dispersed Nov. 22, Teneriffa arriving St. John, N.B. on Dec. 6. On Dec. 26 she joined Convoy HX 99 from Halifax, bound for Avonmouth and Newport with general cargo in station 73. According to the Commodore's notes, she lost touch with the convoy in fog between Dec. 29 and Dec. 31 and never rejoined. The Commodore's narrative, where Teneriffa is mentioned, is also available. Again, the Advance Sailing Telegram for HX 99 indicates she had been scheduled for the previous convoy on Dec. 22, HX 98. Unfortunately, I don't have the original documents for this convoy, so I cannot confirm (I do, however, have Arnold Hague's listing for HX 98, but he does not include ships that were cancelled - see Ships in all HX convoys). 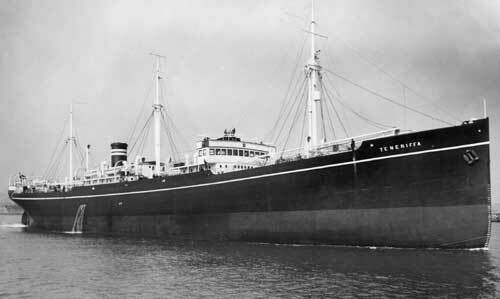 Teneriffa arrived Avonmouth on Jan. 10-1941, proceeding to Newport Jan. 23, with arrival that same day. As already mentioned above, Teneriffa had arrived Newport on Jan. 23-1941. With a cargo of 2400 tons china clay and about 100 tons general, she left Newport again in the morning of Febr. 26 for Milford Haven in order to join a westbound North Atlantic convoy back to St. John, N. B. That same day, she was sunk in the Bristol Channel, position 51 06N 04 49W* after having been machine gunned and bombed by German aircraft. At 14:05, 2 enemy aircraft had machine gunned the ship's decks, coming in for attack 4 times and Teneriffa got 3 direct bomb hits on the starboard side, where deck plates and several plates in her side were blown out. The first hit was in No. 2 hatch, the second in the engine room and the third in No. 3 hatch. After the 4th attack, as soon as the machine gunning stopped, the crew was able to get 3 lifeboats out (the 4th having been blown away), and at 14:25 they saw the ship sink in about 27 fathoms. Just 5 minutes later they were picked up by the British M/S Perdita (Permita?) and landed at Cardiff the next day, Febr. 27. The inquiry was held there on March 10-1941 with the captain, the 2nd mate, Able Seaman Herfjord and Able Seaman Olsen appearing. The 2 able seamen had been working on deck, and having seen British aircraft earlier in the day they did not realize they were in danger upon seeing the 2 planes until the machine gunning started. *The position given above is from "The World's Merchant Fleets 1939", Roger W. Jordan - "Nortraships flåte" gives the position as 51 30N 04 55W. A report presented at the inquiry says the attack occurred about 4 miles off St. Goven lightvessel. One of the survivors, Engineer Ingvald Meyer Stamnes had been alone in the engine room when the bombs hit, and by the time he managed to leave the ship the lifeboats with the other survivors were gone. According to an article in the Norwegian magazine "Krigsseileren", Issue No. 4 for 1984, he spent 2 1/2 hours in the water before he was picked up by a British coastal vessel and taken to Cardiff where he was able to rejoin his shipmates. He had previously been one of the survivors of Beaulieu after that ship had been attacked by the German Widder. My page about Norwegian Victims of Widder has more details on that incident. He died at the beginning of 2006. The captain was in his cabin when the attack started. The 2nd mate was on watch on the bridge - see also crew lists for Cubano, Thode Fagelund and Elin K.
Karsten O. Olsen's other ships are named on this external page. * There was an Olaf Reklev on board Ravnanger when that ship was sunk in Nov.-1940 - same person? Back to Teneriffa on the "Ships starting with T" page. Wilh. Wilhelmsen later had another ship by this name, 1952-1970, 5150 gt. Later named Sol Laila for Johannes Solstad, Skudesneshavn, sold to Hong Kong (Liberian flag) in Febr.-1975 and renamed Sunshine Island. Broken up 1979. The text on this page was compiled with the help of: Wilh. Wilhelmsen fleet list, "Nortraships flåte", J. R. Hegland, "Sjøforklaringer fra 2. verdenskrig", Volume II, Norwegian Maritime Museum, "Krigsseileren", Issue No. 4 for 1984 and misc. (ref. My sources).